Eighty-five years ago, on Sept. 27, 1919, the Connecticut Aggies traveled in high spirits to the University of New Hampshire for a Saturday afternoon football game. It was the season opener for Connecticut Agricultural College (CAC, which later became the University of Connecticut), and the first game played since before the United States' entry into World War I in 1917. 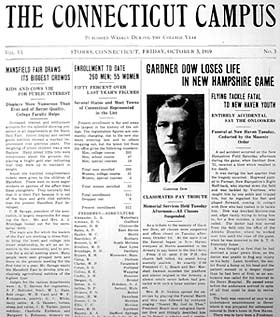 The October 3, 1919 issue of the Connecticut Campus reports the death of Gardner Dow after colliding with another football player during a game. 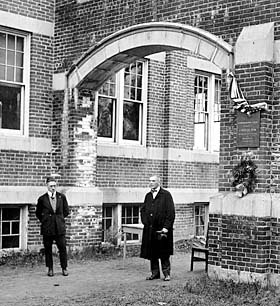 President Charles L. Beach, right, and Paul Manwaring, a studentt stand under the north arch of Hawley Armory at the dedication of Gardner Dow Field on Alumni Day, May 22, 1920. After the north and south arches were taken down sometime around 1950, the Dow plaque was moved the to west side of the Armory building. But the team's return to Storrs later that day was marked by silence, sadness, and tears. During the game, Gardner Dow, a football player for CAC, collapsed after colliding with a player from the opposing team and died before an ambulance arrived, despite efforts to revive him. Dow almost did not play against New Hampshire. The day before, the Connecticut Campus reported that Dow was out with a bad ankle. His death came just a year after the college and its alumni had mourned the deaths of seven students and graduates who died during the First World War. 2:30 President C.L. Beach and Rev. Marshall Dawson mounted the platform and silence reigned in the Armory, a silence which never before had prevailed with such a large number present." 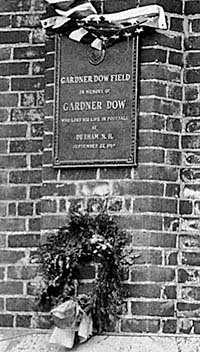 A few days later, on Oct. 6, the Athletic Association, which had oversight of all campus athletic activities and facilities, voted to name the college's athletic field the Gardner Dow Field. "The significance of the name should give an added dignity to the place," noted an editorial in the Oct. 10, 1919 Connecticut Campus. "May we, as a college, never forget the responsibility under which we may be proud of it as we are of him." The football team voted to continue its season, losing all but the last of their seven games - a 7 to 3 win over Rhode Island. That game, the first win over "Rhody" in what was then an 18-year series, was the only bright spot in a dismal, tragic fall. On Sept. 27, 1920, a ceremony marking the first anniversary of Dow's death included a speech by faculty member Henry Monteith to students, faculty, and staff assembled in Hawley Armory. "The most glorious death," Monteith said, "is on the field of battle in the service of home, country, or college. For it is met while mind and body still work to the last minute in perfect accord." Connecticut Agricultural College's football team plays an unidentified rival on Dow Field around 1920. At left is Koons Hall, and to the right is Hawley Armory. The athletic fields that carried Dow's name extended from the rear of Hawley Armory westward toward what is now Hillside Road. 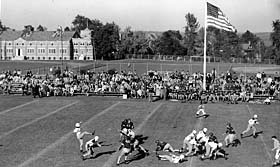 During the five decades after Dow's death, it was home court to the college's football, baseball, soccer, field hockey, and track teams. Over the years, tennis courts and other facilities were added; and archery matches, agricultural shows and fairs, and an assortment of student activities were held there. Beginning in the 1950's, as enrollment increased, new facilities began to replace Dow Field. First was Memorial Stadium for football, then the J.O. Christian Field for baseball. Dow Field began to disappear in the 1970's, when first, the Homer Babbidge Library was built; then the original UConn Co-op building; and more recently, the School of Business and Information Technology Engineering buildings. The field was dedicated with the placement of a plaque on one of two arches that were originally attached to Hawley Armory and served as entrances to Dow Field. When the arches were taken down, sometime in the 1950's, the plaque was moved to the rear wall of the Armory. Hidden by fencing and the Co-op loading area, the plaque was inaccessible for 25 years. Since the Co-op building was razed in 2003, it is again visible near the rear doors of Hawley Armory. ABOVE: A UConn football game in the early 1940s shows some of the expansion of Dow Field, with the baseball diamond at right, rear.